What Info Is Stored in Employee Medical Records? The employee medical file is the repository for everything that has to do with health, health benefits, employee health-related leave, and benefits selections and coverage for the employee. The employer keeps a medical file separately for each employee. The contents of these files are never intermingled with any other employee file such as the personnel file. Since the medical file contains sensitive and confidential information, it must reside in a safe, locked, inaccessible location. The file cabinet that houses employee medical files should also lock and HR staff should have the only keys. Access to employee medical files is restricted to Human Resources staff only. 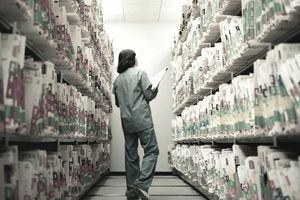 The Health Insurance Portability and Accountability Act of 1996 (HIPAA) requires employers to protect employee medical records as confidential; medical records should be stored separately and apart from other business records. Never store employee medical records in the employee’s general personnel file. These are the types of items that should be stored safely away in the employee’s medical file. If in doubt, err on the side of protecting the medically related information of your employees. If you keep these files confidential, your employees will trust you and you will uphold the spirit and significance of the law.